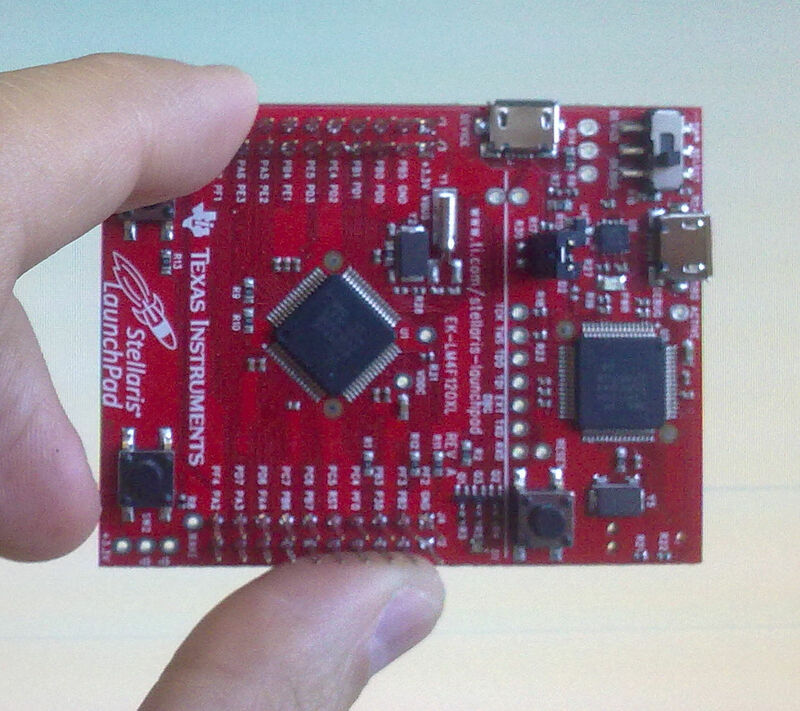 Code Composer Studio (CCS) is the IDE from Texas Instruments. It's Eclipse based and you can use it with the Stellaris Launchpad without any limit on the code size. Keil RealView MDK-ARM: This is a popular IDE supporting several chip architectures, including the ARM Cortex M4 in your Stellaris LaunchPad. You can freely download an evaluation version, which is 32 kiB code size limited. IAR Embedded Workbench. Another popular IDE. It has also an evaluation version, with a 32 kiB code size limit. Sourcery Codebench. An IDE by Mentor Graphics. You can download a 30-day evaluation version. If you want to stick to non-limited non-pay options, you can use Code Composer Studio. End of story. See you in Hack a Day when you finish your neat gadget! Are you still reading? If that's the case, maybe you don't like/have a Windows box for developing, and all the four IDEs I have mentioned are Windows only. But don't worry, of course you can develop for this board using GNU/Linux. Don't forget GNU/Linux is the best OS for software developing ;-). I'll write some entries detailing all the process needed to set up the toolchain, build the StellarisWare libraries, build your project, flash and debug it and set up an Eclipse project. In the end, we will have a completely FOSS IDE without any time/code size restrictions! But enough talk, let's get our hands dirty! In these tutorials, I'll put all the tools for Stellaris development in a directory called src/stellaris under my home. The first step is to build the toolchain containing the assembler, C compiler and libraries, linker, etc. To build it I followed the steps posted in Recursive Labs Blog, almost unmodified. You will have to restart your session for this change to take effect. The easiest way to configure the Stellaris MCU and its peripherals is to use the StellarisWare library. This library is really complete and easy to use, and has another cool advantage: it's also included in the ROM inside the LM4F120 MCU (you just have to add the ROM_ prefix to the function calls to use the ROM software). This can help saving Flash memory space. Download the library sources package. You can find it here. You'll need a my.TI account, so if you have not one, you'll have to register. These steps will build StellarisWare library and also the examples. StellarisWare example files are not BSD licensed. They have some obscure license terms, including the startup code files, the linker scripts and the Makefiles for building them. This can be a problem for some users, so be warned. The program should be successfully flashed to the MCU, and you should see a green LED blinking in the board. If that's the case, congratulations, your toolchain is working perfect! In the next chapter we will learn how to set-up OpenOcd and GDB for debugging programs. We will also see how to avoid problems with the clunky license that comes with the examples in the StellarisWare package. Happy hacking, and stay tuned! Thanks so much for a great step-by-step. Blogger took as an HTML tag and ate it :-P. Thanks for the correction, it's fixed now. thanks seems to work, its blinking good. It looks like you are building as root. Maybe that's not related to this problem, but usually it's not a good idea to build stuff as root. I am running Ubuntu 12.10 under VirtualBox on Windows. Step 2 under Building the toolchain, the apt-get is missing python-yaml, it was needed to build libopencm3. I reinstalled the libusb1.0 library as well as the dev version and still no luck. Any help would be awesome. Did you successfully create the rule to give permissions to use ICDI interface? (step 3). Try flashing with root permissions (e.g. : "sudo lm4flash blinky.bin"). If it works this way, maybe the rule was not properly created. Bus 001 Device 004: ID 067b:2506 Prolific Technology, Inc. Bus 005 Device 003: ID 1cbe:00fd Luminary Micro Inc.
IIRC, the launchpad enumerates as a "Luminary Micro Inc.", so it's properly detected by your system (I presume). But make sure you replace the path I wrote with the correct one for your system. Thank you very much!! That seemed to make it work, I assume I should see a green LED flashing at a fast rate. The question now is how do I make it that I do not need the full path every time ? What a good tutorial! Although it was a bit of a struggle for me, being very new to linux/ubuntu, i got it working so far. Can't wait for the next section. I got this working on two different machines, both freshly instaleld Ubuntu 12.04.4, and both were zlib.h missing during the building of the toolchain. The one machine got "sudo apt-get install libcrypto++-dev" installed, the other one "sudo apt-get install zlib1g-dev". Both worked, which one is better remains unknown to me. I made a tutorial base on yours for the new TIVA launchpad, if you want to see, this is the link http://esplatforms.blogspot.com.br/. Why do you need to erase the code? Yo usually do not need to. Each time you program the chip, it is erased before the new code is flashed. I think lm4flash doesn't have a chip erase function. Maybe you can clear the chip using gdb+openocd (openocd has "flash erase_sector" and "flash erase_address" commands). Make cannot find the compiler. Either the compiler (arm-none-eabi-gcc) is not installed, or it is not added to the PATH environment variable. By doragasu. CC BY-SA. Simple theme. Powered by Blogger.